Spectacular attractions and the excitement of discovering Mother Nature’s best kept secret draw travelers from around the globe, promising both relaxation and the richly rewarding authenticity sought after in a genuine Caribbean getaway. Nestled between Mexico and Guatemala, on the Caribbean coast of Central America, Belize is one of the few territories on the planet that remains unspoiled. It offers the very best of both worlds: the majesty of the rain forest and the mystery of the ancient Mayas, along with white-sand beaches and a spectacular 174-mile-long coral barrier reef. Belize is 176 miles long at its longest point, 88 miles wide at its widest. Its total surface area covers 8,867 sq. miles, including 266 sq. miles of offshore islands. It is the only country in Central America that does not have any coastline on the Pacific Ocean (its east-facing coast is bathed by the Caribbean Sea). Unlike the rest of the nations in Central America which were colonized by Spain, Belize used to be a British colony. Today, Belize's official language is English, and the Government and legal system are based on the Westminster system. Although it has been an independent nation since 1981, Belize continues to be part of the British Commonwealth with the Queen as Head of State, represented locally by a Governor General. 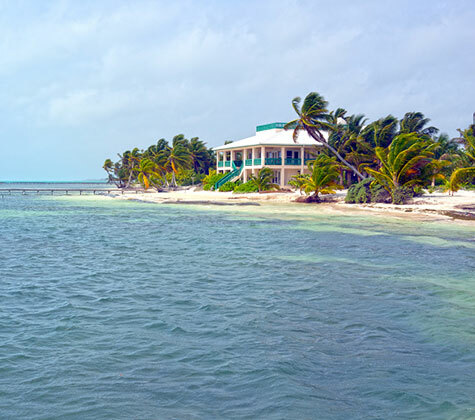 Come to Belize and find your dream property in this paradise on earth. We offer a broad range of options for sale or rent, from perfect condominiums and holiday resorts with beautiful mountain/ sea views, to land or estates to retire to, as well as homes or residential developments in top private residential communities.